I wrote a piece a couple years ago about how ocean pH levels are expected to get more acidic as more carbon dioxide is absorbed in the water. A more acidic ocean would mean trouble for organisms that form skeletons from calcium carbonate. But while carbon dioxide levels in the atmosphere are higher than they have been in the last 420,000 years, scientists such as Yale’s Mark Pagani are finding evidence of carbon dioxide levels five times as high as today’s levels, when they look at ocean drilling cores dating back to over 50 million years ago. 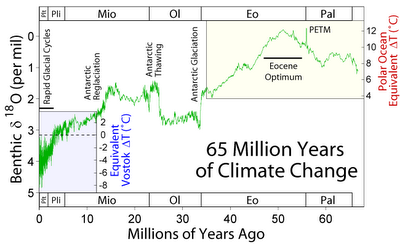 That period was the warmest of the last 65 million years. It is the period when the first mammals were taking over, following the Initial Eocene Thermal Maximum, a period of global warming lasting 20 to 100 thousand years, warming the high latitudes by up to 7 degrees Celsius. It was a strong extinction event. The polar regions had climates similar to the Pacific Northwest, and tropical climates extended to what is now the U.S. Canadian border. The main suspect for the cause of this temperature spike is the destabilization of marine clathrates. These are ice-like compounds made from methane and water. When they warm up, they release methane, a potent greenhouse gas. There is a whole lot of this stuff on the ocean floor, and if something causes them to release methane into the atmosphere all at once, we can expect temperatures to rise very suddenly. During the Thermal Maximum, an estimated 2 trillion tons of methane was released into the atmosphere. What is important for marine organisms with shells of calcium carbonate is something called the lysocline. Shallow waters are supersaturated in calcium carbonate, so the shells don’t dissolve. But deeper in the water the saturation decreases, until a point is reached where calcite and aragonite (the minerals the shells are made of) dissolve. Evidence from ocean drilling cores shows that during the Paleocene/Eocene Thermal Maximum 55 million years ago, the lysocline rose by half a kilometer. The current lysocline depth is about 4.5 kilometers in the Pacific, and 5.5 kilometers in the Atlantic. So shallow water organisms will still retain their ability to make shells and coral reefs. In fact, coral reefs grew in the warm waters of the Eocene Optimum, when the polar ice was melted, and the thermal expansion of the oceans caused sea levels to rise. When plate tectonics joined North and South America at Panama, and ocean circulation patterns changed enough to cause reglaciation, sea levels fell, and the erosion of those coral reefs added calcium carbonate to the oceans, causing the lysocline to fall over a kilometer. So the oysters will probably survive. But what species dominates the land after the next thermal mass extinction is less certain.